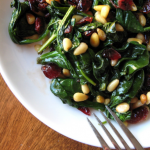 This low carb sauteed spinach recipe gets an additional crunch from cashew nuts. It's fresh, healthy, and surprisingly a great comfort food! In a skillet, heat vegetable oil and sesame oil over medium-high heat. Add cashews and toast for 2 minutes, or until fragrant. Add spinach and cook for 5 to 6 minutes, or until spinach is wilted. Add lime zest, lime juice, salt, and pepper. Stir to combine. Cook for 1 to 2 minutes, or until heated through.